Unleash your inner artist with the Morphe x James Charles Artristy Palette; a 39-pan palette brimming with a rainbow of sumptuous shades that rival Joseph’s technicolour dreamcoat. 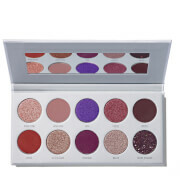 Curated by the iconic, boundary-pushing makeup artist and YouTuber, the James Charles palette encourages experimentation with its carefully combined pressed pigments and eyeshadow shades, offering you the opportunity to get your creative juices flowing and explore an endless range of eye and face looks. Highly pigmented, buildable and ultra-blendable, the eyeshadows pack on unmistakeable colour that enhances your features and lasts for ages. Apply alone or blend together for customised colour with Morphe Eyeshadow Brushes for seamless blending. Pressed Pigments: Mica, Talc, Calcium Sodium Borosilicate, Phenyl Trimethicone, Ethylhexyl Palmitate, Isononyl Isononanoate, Tridecyl Trimellitate, Magnesium Myristate, Methyl Methacrylate Crosspolymer, Nylon-12, Magnesium Stearate, Silica, Boron Nitride, Polyethylene, Tocopheryl Acetate, Synthetic Fluorphlogopite, Isostearyl Isostearate, Tin Oxide, Caprylyl Glycol, Ethylhexylglycerin, Phenoxyethanol +/- May Contain/Peut Contenir: Titanium Dioxide (CI 77891), Iron Oxides (CI 77491, CI 77492, CI 77499), Yellow 5 Lake (CI 19140), Ultramarines (CI 77007), Manganese Violet (CI 77742), Yellow 6 Lake (CI 15985), Red 6 Lake (CI 15850), Red 7 Lake (CI 15850), Red 40 Lake (CI 16035), Red 27 Lake (CI 45410), Red 33 Lake (CI 17200), Bismuth Oxychloride (CI 77163). 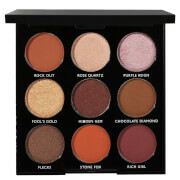 Eyeshadows: Mica, Talc, Synthetic Fluorphlogopite, Calcium Sodium Borosilicate, Magnesium Myristate, Phenyl Trimethicone, Ethylhexyl Palmitate, Isononyl Isononanoate, Tridecyl Trimellitate, Methyl Methacrylate Crosspolymer, Magnesium Stearate, Nylon-12, Silica, Boron Nitride, Polyethylene, Tocopheryl Acetate, Isostearyl Isostearate, Tin Oxide, Caprylyl Glycol, Ethylhexylglycerin, Phenoxyethanol +/- May Contain/Peut Contenir: Titanium Dioxide (CI 77891), Iron Oxides (CI 77491, CI 77492, CI 77499), Yellow 5 Lake (CI 19140), Blue 1 Lake (CI 42090), Ultramarines (CI 77007), Manganese Violet (CI 77742), Chromium Oxide Greens (CI 77288), Red 40 Lake (CI 16035), Bismuth Oxychloride (CI 77163).